Tinners Way, a multiple Grade 1 winner and the last colt born of the great Secretariat, has died. 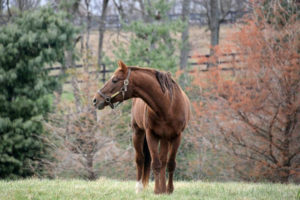 The 27-year-old stallion was euthanized July 5 at Old Friends, the Thoroughbred Retirement Farm in Georgetown, KY., where he had been pensioned since 2010 after standing stud in Texas. Bred and raced by Juddmonte Farms, Tinners Way (Secretariat – Devon Diva, The Minstrel) began his career in Europe, where he won three of his seven starts in England and France, including the City of York Stakes and the Milcars Temple Fortune Stakes on the turf as a 3-year-old. In the U.S. as a 4-year-old, Tinner joined California-based trainer Bobby Frankel’s barn, and under the Hall of Famer’s watchful eye the striking chestnut won the Grade 1, $1 million Pacific Classic in 1995, beating future Hall-of-Famer Best Pal and posting a record-equaling mile and a quarter of 1:59 2/5 , a time reminiscent of his sire’s Kentucky Derby run. Tinners Way had a repeat victory in the ’95 Pacific Classic, where he defeated 1994’s Breeders’ Cup Classic champion Concern, and he earned yet another grade-one win the following year in The Californian. Throughout his career Tinner’s Way faced off against numerous Old Friends pensioners, including Awad, Kiri’s Clown, and Alphabet Soup. Sent to stud in 1997 after 27 starts, seven wins, and career earnings of $1,849,452, Tinners Way stood at Vinery in Kentucky, Harris Farms in California, and finally at Key Ranch in Texas, where he retired in 2010 as the richest racehorse in Texas. He was donated to Old Friends by owners Phil Leckinger and Jerry Hardin.